Say what you want to about DreamWorks being an inferior animation studio, and I’m definitely a Pixar man myself, but there’s one inarguable fact that we can’t deny; they know how to make money. Only 1 of their 31 feature films released since 1998 has failed to turn a profit (The Road to El Dorado), and only 2 others has even come close (Sinbad, Flushed Away). The others, though they may not be pieces of cinematic genius, have raked in the dough. Antz, The Prince of Egypt, Chicken Run, the Shrek movies, Shark Tale, Madagascar, Wallace & Gromit, Over the Hedge, Bee Movie, Kung Fu Panda, Monster vs. Aliens, Megamind, Puss in Boots, Rise of the Guardians, The Croods, Turbo, Mr. Peabody & Sherman, Penguins of Madagascar, Home; these aren’t exactly the films that you want to define your legacy as a company, and let’s be honest, most of them are simply no good. But man does DreamWorks make money, continue to pump out easy entertainment, and show no sign of stopping. What does this all have to do with HTTYD? Nothing really, since this film happens to be the best thing DreamWorks has ever produced, rivaling Pixar & Disney with a quality that can’t be ignored. On the Viking island of Berk, it’s kill or be killed. Not that war or aggression are things that the men & women there love, nor is it a human vs human battle for survival. No, they have a bigger problem them petty squabbles on Berk, namely dragons. And not just a few mythical beasts, but a constant barrage of varying kinds of hell-breathing dragons whose only mission is to steal sheep, terrorize the populace, and attack whatever moves. So life for these Vikings is more than tough, it’s a constant battle against the constant dragon attacks, a world where Warrior is the only occupation. Hiccup, son of Stoik the Vast, yearns to be the son his strong chieftain father wants him to be, but he seems to be more of a hinderance than a help when it comes to defending the village. And so when he actually shoots down the dreaded Night Fury dragon and goes to finish the job, he thinks that he’s on his way to becoming the killer everyone wants him to be. 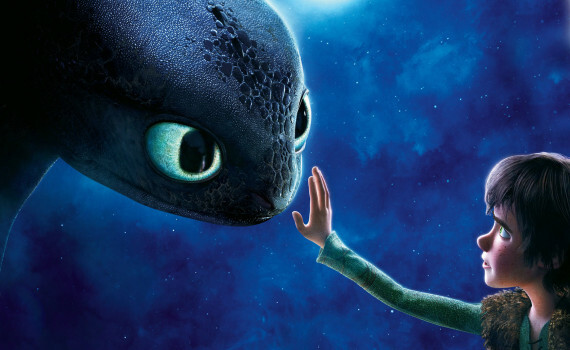 But a strange connection begins between Hiccup and the dragon he’s supposed to hate, a connection that neither can explain, an understanding that perhaps these two separate species can live together in peace where there hasn’t been any in so many violent generations. What a story. It’s cool enough that a bunch of Vikings are living on an island in the rough sea, with their weapons, helmets, accents, and beards. But add in the fact that they fight dragons for breakfast and you’ve got yourself a plot. And not just any dragons, but a variety of beasts with different colors, sizes, and talents. It’s like an alternate history come to life, and brought to life with an incredible amount of skill. And when all that action becomes the background, a real heartfelt story surfaces; father/son, boy/animal, taking your place, finding yourself, standing up for what you believe in. It’s a movie filled with morals, a classic plot presented to us in a different light. Visually, the animation is only OK, as far as the characters go, but the action was done very well and all the panoramic or epic scenes were pretty spectacular, blowing audiences away with depth and excitement. This film really is the best thing that DreamWorks has ever done. It has a great base for grownups & children alike, it’s entertaining in a way that never dumbs down or goofs off, there’s heart here from Jay Baruchel as Hiccup becomes the man he wants to be, and you know, there are dragons, and that’s just cool.